London, United Kingdom — Healthy snack brand graze, which rose to prominence as one of the pioneers of the healthy snacking movement, has revealed a new brand identity as part of a wider initiative that aims to tap into changes in consumer preferences surrounding snacking. As part of the rebrand, graze plans to challenge negative perceptions related to snacking and lead the way in creating new products that are healthier, tastier and fresher, to appeal to current market trends. “As a business, we have always aimed to challenge the perceptions around snacking. So, after nearly a decade of brown packaging, we decided the time was right for an image shake-up” commented Anthony Fletcher, CEO at graze. Founded in the UK in 2008, graze has grown from a bedroom startup to an international business employing over 500 people. Launched into UK retail in 2015 and US retail in 2016, the brand is now present in over 30,000 retailers across both markets. Today the business is majority-owned by American investor The Carlyle Group, with Octopus Investments, Draper Esprit and management owning the remaining share. Over the past decade, the business has firmly disrupted the healthy snacking segment with its direct to consumer subscription model, however with a growing number of competitors such as Primal and The Nutribox also gaining their share of the market, graze has turned its attention to cementing itself at the forefront of healthy eating innovation and pushing forward as a disruptive leader in the sector. To execute this vision, in addition to enlisting creative agency Jones Knowles Ritchie to help define and develop its branding in an increasingly health savvy market, graze has also worked closely with its own customers to test and validate its renewed identity. This it says, encapsulates striking the balance between taste and health, providing snacking options for people with increasingly busy lives and spotlighting its restlessness for innovation. Speaking about the rebrand, Fletcher revealed that transparency has also been a crucial theme. “As the industry has evolved and consumers have become increasingly health savvy, it is more important than ever that we at graze clearly communicate the key health benefits associated with our products,” he told Welltodo. Having worked with a range of innovative brands in the wellness space including Hippeas, Ugly Drinks, Plenish, The Gut Stuff and WOW, Jones Knowles Ritchie recognises the shared mission of all of its clients — to ensure that they stand out within their respective categories. “We want to empower innovative businesses to have an impact and a universally recognised personality while avoiding looking like a small, artisanal brand which could easily be replaced in its marketplace,” explained Lee Rolston, Strategy Director at the creative agency. “Our job is to inject a sense of stature and communicate a clear definition of what the brand stands for in order for it to be more loved in its respective markets and grow faster than its competition,” he added. According to Rolston, as new categories continue to be created by innovative brands in the wellness market, they quickly develop codes and behaviours which others try to imitate. “Graze effectively created the code on how a healthy snacking brand should behave, look and feel but many of these have since become category norms taking away from the business’ originality,” he told Welltodo. In light of this, he worked with the design team at graze to take the brand to the next level in order to be more distinctive. This was achieved by giving the brand a stand-out word mark and colour palette, as well as developing a holistic brand experience with more visible brand icons and a navigation system for its expanding portfolio. “We feel that the brand’s image is now more recognisable and iconic while retaining the authentic charm we all know and love,” he explained. With the rebrand still in the process of being rolled out across all customer touch points, at present it’s difficult to determine its success, admitted Fletcher. 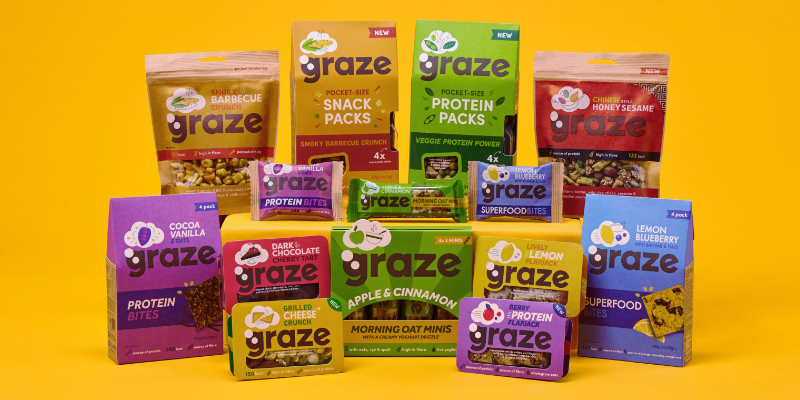 However, with graze dedicated to its mission of challenging the perceptions around snacking, if the rebrand goes some way towards achieving this then graze will remain positive about its outcome, he concluded.